The benefits of Massage Therapy. Massage Therapy is a proven form of stress relief. According to a study completed by the American Massage Therapy Association, “87% of individuals view massage as being beneficial to overall health and wellness.” There are many medical issues that can be positively affected by massage therapy, but we would like to focus on just the relaxation benefits in today’s blog. Everyday, we all have issues that push and pull us in many different directions, sort of our personal whirlwinds. It is only when we step outside of those whirlwinds that we finally find our center. There are many different modalities of “stepping outside our whirlwinds”, one of which is massage therapy. Introducing massage into your lifestyle as a form of relaxation is an important step towards managing that whirlwind. Whether the massage is in the form of a relaxing Swedish Massage, a cross-specialty Integrative Massage or a penetrating Deep Tissue Massage, the benefit is immediate and lasting. Choosing where to get your massage is important as well. The environment that you select to have your massage in is synergistic and will either reduce or enhance your experience. Select a day spa that is reflective of the experience that you would like to enjoy and relax in. So, plan some time away from your “whirlwind”, find your day spa, schedule a massage and relax. 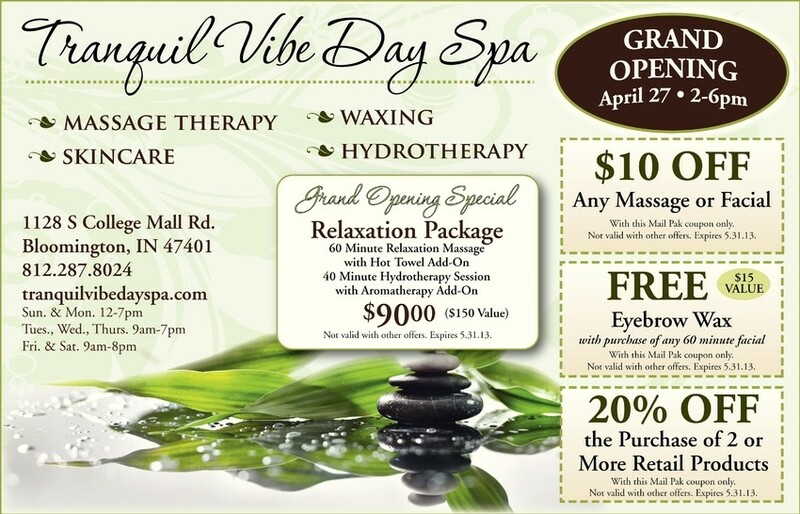 Posted in Tranquil Vibe Day Spa News | Comments Off on The benefits of Massage Therapy. 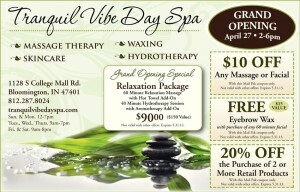 Tranquil Vibe Day Spa is celebrating its Grand Opening April 27th from 2-6pm. Relaxation Package: 60 minute relaxation massage with hot towel add-on. 40 minute hydrotherapy session with aromatherapy add-on.